In our last article we had a look at what modern agriculture defines as a ‘good produce’, the characteristics of which were listed as High Quality, Uniformity, Suitability for the Climate, High Productivity, Quick Growth, Tolerance to Diseases and Pests, and Market Requirement. Good produce begins with good seeds and the advancements made in seed technology have produced several seed-types such as Open Pollinated Seeds, Hybrid Seeds, Native or Heirloom Seeds and GMO seeds, to help farmers maximize their harvest, in conjunction with the farming methods they employ. 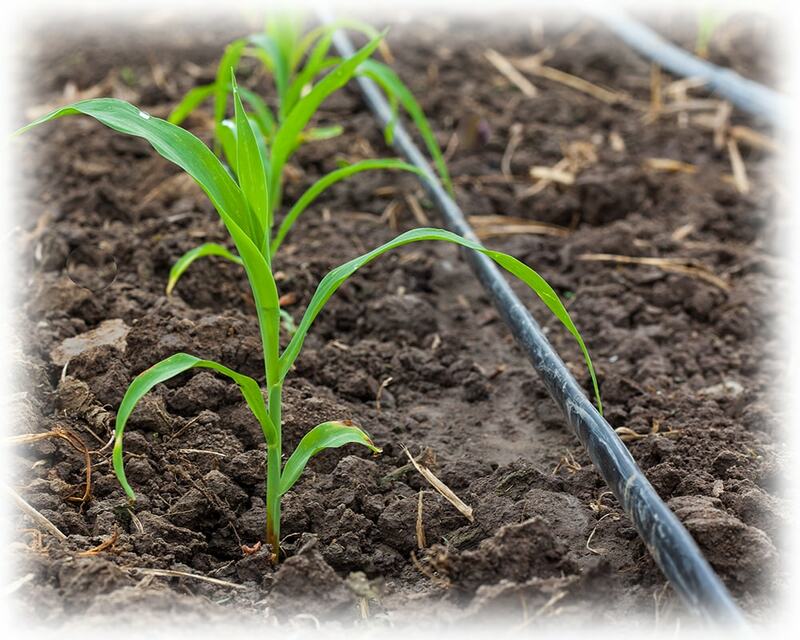 In this article we look at drip irrigation and the benefits it brings to farmers. Irrigation is the artificial application of water to land for the purpose of agricultural production. Since around 3000BC, resourceful farmers have been doing this by diverting streams, rivers and lakes to provide water to their fields. Over this time traditional irrigation methods, which include; basin irrigation, ridge and furrow irrigation, manual-horse/basket irrigation, furrow irrigation, and flood irrigation have had incremental improvements. The drip irrigation brings a significant improvement in the efficiency of the irrigated water and is a method only possible thanks to the technological advancements of the 20th century. In order to understand the significant benefits drip irrigation brings it is important to first understand what a good soil is. From what has been observed empirically a good soil that optimizes plant growth and nutrient absorption has a composition of 50% soil, 25% water, and 25% air. Traditional irrigation methods all rely on the periodic application of water, and therefore when utilizing any of them it is impossible to consistently maintain such a healthy soil ratio. Instead water is applied to the fields in excess amounts to account for the fact that a great percentage of it will be lost through evaporation or leaching. Which means that at any given time there is either too much or too little water. This excess of water is very unhealthy for most crops and can result in the rapid spread of fungal and bacterial diseases such as root rotting, bacterial wilt, fruit rot and other various leaf disease caused by excess moisture. Other disadvantages of traditional irrigation include; soil erosion, higher water consumption, insufficient water consumption, higher labor costs and variations in crop growth. Drip irrigation solves these issues by maintaining an ideal soil composition through delivering water continuously, drip by drip, as and when the crops need it. Drip Irrigation is an important evolution in farming technology and is by far the most efficient irrigation method. This is because it maintains ideal soil conditions by dripping water to the active root zone of each plant, at the necessary intervals. First the Drip System takes water pumped from a onsite-source and directs it through a series of filters to improve its quality. The composition of this series of filters will vary based on the quality of the water source. Only after which the system pumps this cleaned water through a network of valves, pipes, tubing and emitters to the active root zones of the plants. By adjusting the various control valves and pressure gauges, the pumped water can be directed to each plant in a highly precise manner to optimize the growing condition of the soil. The system can be connected to fertigation equipment along the filter unit which will then enable it to fertilize the crops during the process of irrigation, with the same precision. Drip irrigation requires 30-70% less water than traditional methods. And the application of water is easily generated via low-cost, low pressure, locally sourced pumps. The system maintains an optimal soil condition which has an efficiency rate of 95%, and can enhance the crop yield by 200%! Since the water is applied directly to the root zone it reduces the risk of pest and fungal diseases by maintaining a dry leaf canopy. Drip irrigation works uniformly across many topographical environments, in the hills and on the plains. Even problem soils with less infiltration rates can be irrigated well through controlling the regularity and quantity of the water delivered. The system also facilitates good root growth, resulting in a highly concentrated root system. The system is automated and farmers can control it remotely, reducing the amount of labor necessary. It can even be connected with fertigation equipment which significantly increases the efficiency of fertilization, providing crops with nutrients only when required. This increases the harvest yielded and reduces the cost fertilizer. The delivery of fertilizer in this manner also reduces fertilizer runoff which can pollute nearby water bodies. Although Drip Irrigation is far more advanced, and efficient than traditional irrigation methods, its’ slow adoption would indicate the many challenges involved with implementing it. It requires both learning and practice on the side of the farmer to be able to both operate and troubleshoot the system on a day to day basis. This is because the system requires both specialist knowledge and continuous maintenance to prevent corrosion or damage to the equipment. Pumps and other equipment must be replaced at the first sign of damage or malfunction to avoid the risk of compounding the issue. This necessitates a strong and dependable relationship between the supplier, contractor and the farmer. The use of computerized irrigation systems, and the maintenance of data records require personal with a training in basic IT. The system can be a high initial investment. Which can be difficult to overcome if the previously stated challenges are not correctly addressed. While drip irrigation is a huge leap forward in the advancement in irrigation practices its adoption has been restricted in Sri Lanka by a lack of education and training. In order to be able to grow our local agricultural sector and improve the living standards of farmers it is essential that local businesses and governments come together to empower the farmers with such technology and technical expertise. Such collaborations are essential for the benefit of all and drip irrigation is one such key technology that needs to be developed through such collaborations. If implemented correctly such systems will help increase both the overall harvest as well as the profit margin for the farmers and as a nation reduce imports on food imports and fertilizers.